HPLC | Centro Interdipartimentale per lo Studio degli Amianti e di altri Particolati Nocivi "Giovanni Scansetti"
The 1525 and 1525 with EF heads are integrated, high-pressure, binary HPLC pumps that feature on-board pulse dampening and efficient mixing. Their pulse-free solvent flow, from analytical to semi-preparative flow rates, makes them ideal for use with highly sensitive detectors. Designed for use with 2 to 4.6 mm I.D. columns in routine LC and LC/MS applications, these pumps have a programmable flow-rate range of 0.00 to 10.00 mL/min in 0.01 mL increments. The 2489 UV/Visible Detector is a versatile, dual-wavelength absorbance detector for HPLC. This detector offers the high sensitivity required for routine UV-based applications to low-level impurity identification and quantitative analysis. The detector’s extended linear range of 2.5 AU makes for easy quantitation of both major and minor components in the same run. You can also simultaneously monitor absorbance at two user-selectable wavelengths for more information per run. 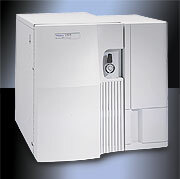 Operating as a stand-alone or as an integral component of Waters HPLC Systems, the 2489 will enhance the productivity of your chromatography laboratory. Compatible with flow rates as high as 300 mL per minute, the Fraction Collector III handles a variety of adapter racks and collection vessels within a compact footprint. The personnel of the Centro Scansetti mostly uses the HPLC equipment to characterize, separate and collect fungal and lichen metabolites yielding the deterioration of asbestos and other toxic particles and inactivating their surface reactivity.